• Thicker, Shinier & Healthy Hair! 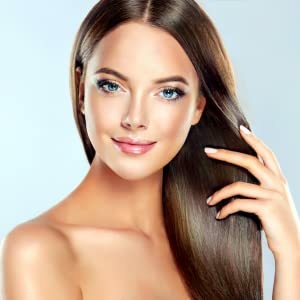 - Our healthy and 100% natural dietary supplement contains Biotin, which plays a vital role in hair growth, since it helps hair grow faster, protects against dryness, increases hair elasticity and prevents breakage. • 100% Natural Ingredients For Stronger Nails & Firmer Skin! - Enriched with Vitamins like Vitamin B6, Folic Acid and active Minerals, such as Zinc, Calcium, Manganese, Iron and Potassium, the Bondi Morning capsules will help reduce the sings of skin aging and strengthen your nails naturally. • Nature's Most Powerful Vitamins In A Single Convenient Capsule! - Perfect for both men and women, the Bondi Morning Hair, Skin & Nails elite dietary supplement will help prevent hair loss, while promoting healthy blood flow to the scalp due to its high content of Vitamins A, D, C, E, B5, B6 & B12! we promise to offer you a no-questions-asked, full refund. WHY CHOOSE BONDI MORNING HAIR, SKIN & NAILS DIETARY SUPPLEMENT? PROMOTE CELL GROWTH & HEALTHY BRAIN FUNCTION – thanks to its Vitamin B6, which is crucial in the development of red blood cells and will support a healthy nervous system. STRENGTHEN YOUR SENSITIVE SKIN – by adding Folic Acid to your diet, our dietary supplement may help reduce signs of skin aging and support firmer skin. FEEL HEALTHIER & STRONGER, ONE CAPSULE AT A TIME! That’s right. Now you don’t have to worry about supplying your body with the essential vitamins, minerals and antioxidants, because our experts have combined all the must-have ingredients in an easy-to-swallow capsule! STRONGER HAIR – our natural supplement will not only prevent hair loss, but also increase hair elasticity. HEALTHIER NAILS – prevent nail cracking and strengthen your nails with our healthy blend of vitamins and minerals. YOUNGER-LOOKING SKIN – promote a healthier and glowing complexion by choosing our multivitamin dietary supplement! Bondi Morning is here to bring fun back into health and nutrition, with a line of trusted supplements and vitamins that make mornings something to look forward to. So get out of bed and embrace the day – Bondi Morning’s carefully selected dietary supplements help you wake up with energy.